"Every time I walk the field there is more to pick," says Alex Davis of AD Farm and the Center Market. From Dee Barker of Earthworks Farm: "This week we will have our first gourmet honey jars of the season. Usually, I harvest at the end of August, but we've decided to change our usual regimen to begin the harvest now." "At Muldoon Farmers Market, new carrots appeared—and quickly disappeared—last week. Look for more, and larger, carrots this week," says Jerrianne Lowther. South Anchorage Farmers Market Barbara Landi says onions and beautiful Romanesco cauliflower are on offer. "There was a spattering of them both last week, but this week there will be lots more. Onions are not huge yet but will enlarge every week." Barker of Earthworks Farm says the earlier-than-usual honey harvest is "predominantly wildflower honey since the bulk of it was collected before our cultivated flowers began to open." Earthworks also will have some early carrots. not woody radishes. The flowers are beginning to pop, also. We'll have lovely scented 'stock' flowers, deep burgundy, lemony and golden-colored sunflowers and bright cosmos among the flower selections offered." Rempel Family Farm will have bagged carrots and for the first time of the year sugar snap peas. Other veggies include tomatoes, broccoli, cauliflower, a variety of zucchini, chard, cabbage, radishes, kales, herbs and more. 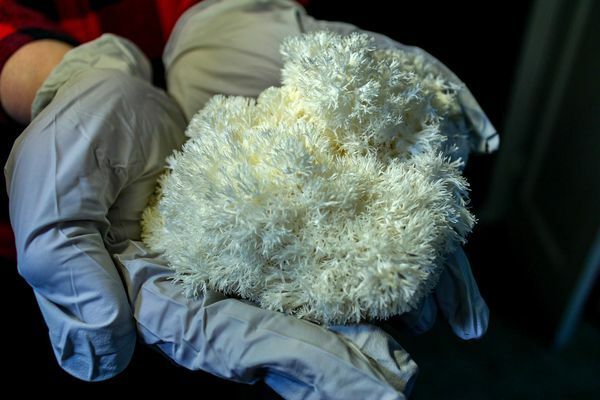 Far North Fungi will unveil a new specialty mushroom—lion's mane. "Lion's mane has a mild lobster flavor and a melt-in-your-mouth, meaty texture," says co-owner Allison Dunbar. "It is best shredded and cooked in butter until golden brown." Far North Fungi will also have its signature blue oyster mushroom and medicinal mushroom tinctures. Arctic Choice says the fresh side stripe shrimp season is starting to wind down, so it's time to stock up. Mark Butler says seven farmers will be at the market with "strong quantities of the valley's finest produce." Among the items to look for include arugula, beets, broccoli, cabbage, carrots, cauliflower, celery, chard, collards, cucumbers, fennel, field greens, kale, lettuces, onions, potatoes, radish, rhubarb, strawberries, tomatoes, turnips and zucchini. Butler says Chugach Electric will be at the market highlighting ways to save electricity, along with Prince William Sound shrimp, doughnuts, picked veggies and other items. A new vendor—Kai's Kakes, Bakes—joins the market along with the regular vendors, including Vang Family Farm, Black Bear Farms, Fresh International Gardens and Seldovitch Farm. Among the produce is salad mix, turnips, perilla, Chinese cabbage, cilantro, peas, radishes, chives, kale, chard, fermented and pickled products, spice blends, rhubarb cake, cookies and muffins. Lowther says highlights include "peonies from Homer, local honey and fresh eggs from Anchorage Urban Farms, and vegan fruit pies, cinnamon rolls and bagels from Home-Baked Delights." Other vendors include Dinkel's Veggies with zucchini, lettuce, cabbage, new potatoes, tomatoes, green beans, sweet onions, pickling cucumbers and more; Vang's Family Farm; Subba Gardens; and Fresh International Gardens. Farm 779 is bringing back some favorites—peony chaga kombucha and caraway carrot kraut. Duane Clark will have new honey and first-of-the-year tomatoes, as well as a huge selection of greens, grass-fed beef and yak, and birch syrup. Davis says his produce haul includes purple cauliflower, red and green romaine lettuce, zucchini, pool ball zucchini, chard, salad mix, baby beets and kale. Other items include a huge selection of pork cuts, eggs, raspberry jam, and items from Alaska Sprouts, Alaska Flour Co., Mosquito Mama and Windy River Farm's grass-fed beef. Sunday in Anchorage: Anchorage Market and Festival, 10 a.m.-5 p.m., Third Avenue between C and E streets; Fourth Avenue Indoor Market, 10 a.m.-6 p.m., 333 W. Fourth Ave. Sunday outside of Anchorage: Tanana Valley Farmer's Market, 11 a.m.-4 p.m., 2600 College Road, Fairbanks.